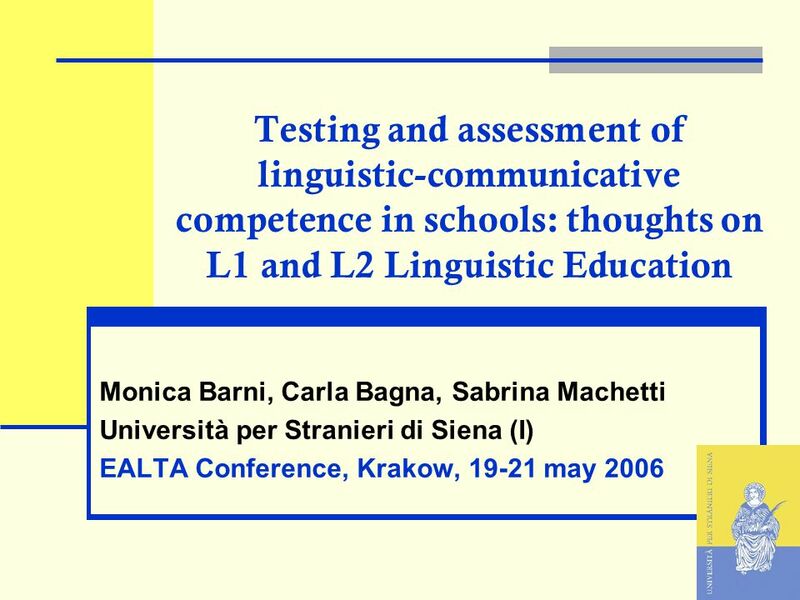 Testing and assessment of linguistic-communicative competence in schools: thoughts on L1 and L2 Linguistic Education Monica Barni, Carla Bagna, Sabrina. 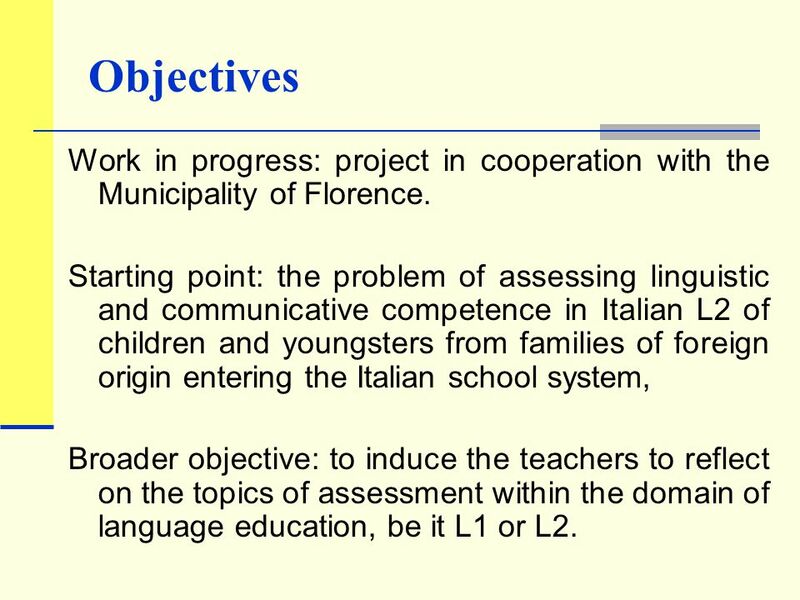 2 Objectives Work in progress: project in cooperation with the Municipality of Florence. 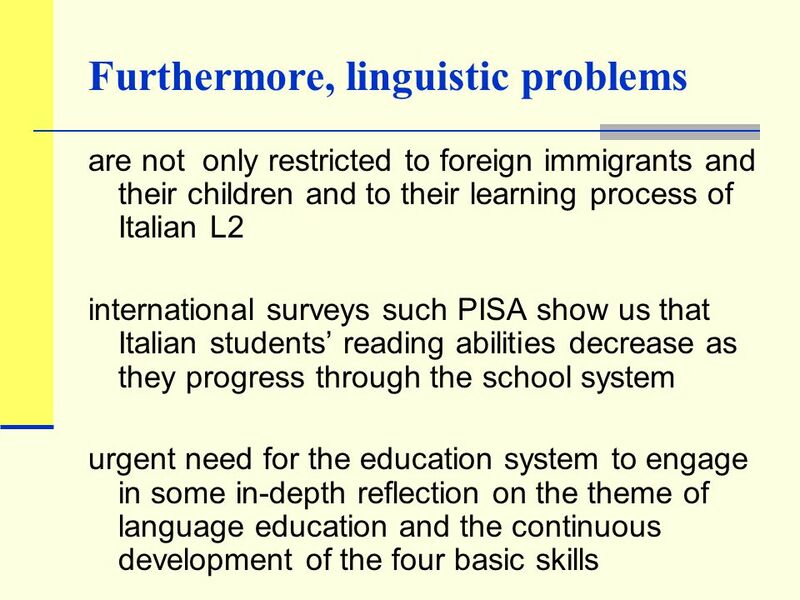 Starting point: the problem of assessing linguistic and communicative competence in Italian L2 of children and youngsters from families of foreign origin entering the Italian school system, Broader objective: to induce the teachers to reflect on the topics of assessment within the domain of language education, be it L1 or L2. 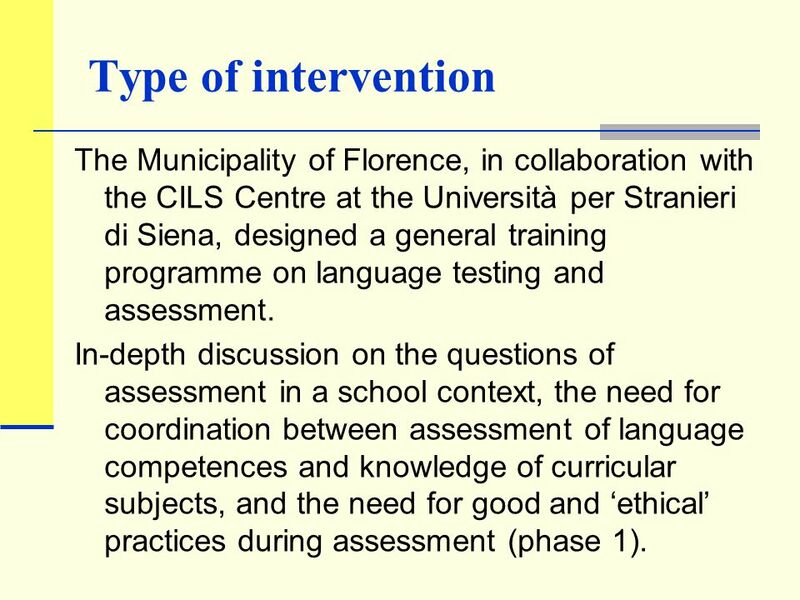 10 Type of intervention The Municipality of Florence, in collaboration with the CILS Centre at the Università per Stranieri di Siena, designed a general training programme on language testing and assessment. 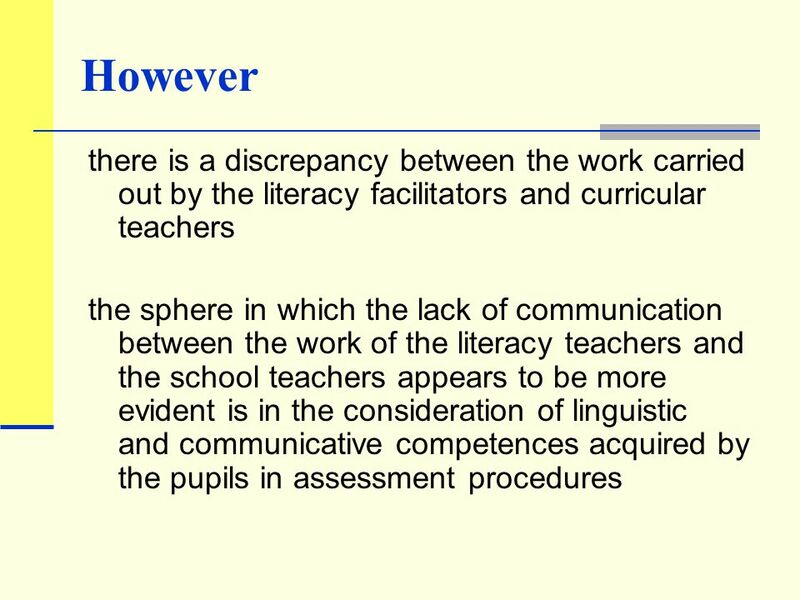 In-depth discussion on the questions of assessment in a school context, the need for coordination between assessment of language competences and knowledge of curricular subjects, and the need for good and ‘ethical’ practices during assessment (phase 1). 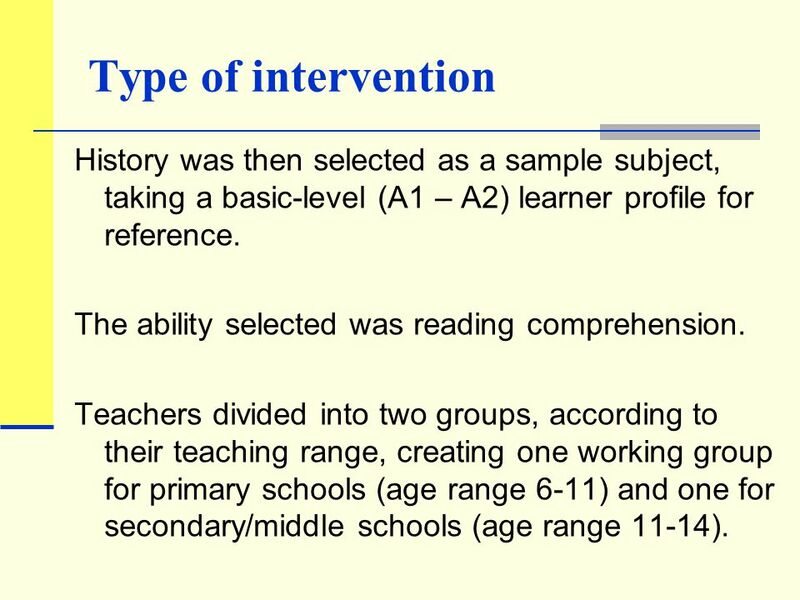 11 Type of intervention History was then selected as a sample subject, taking a basic-level (A1 – A2) learner profile for reference. The ability selected was reading comprehension. Teachers divided into two groups, according to their teaching range, creating one working group for primary schools (age range 6-11) and one for secondary/middle schools (age range 11-14). 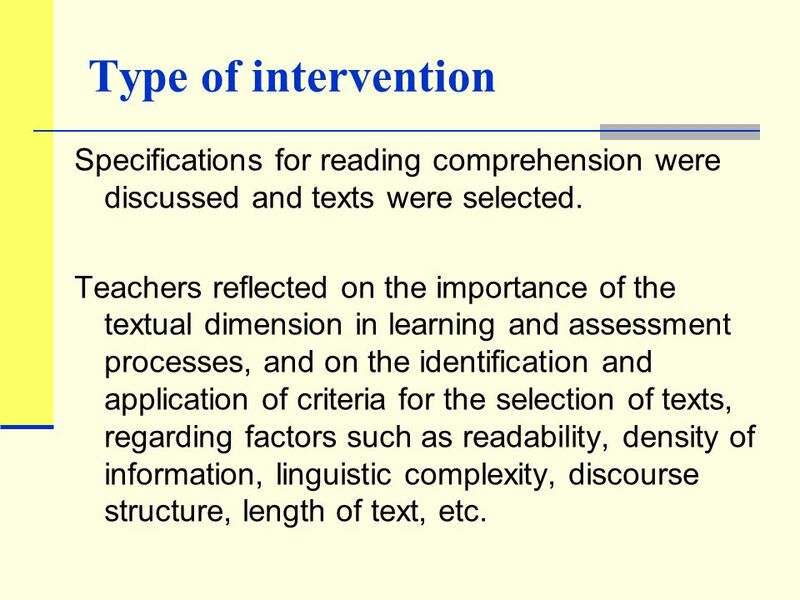 12 Type of intervention Specifications for reading comprehension were discussed and texts were selected. Teachers reflected on the importance of the textual dimension in learning and assessment processes, and on the identification and application of criteria for the selection of texts, regarding factors such as readability, density of information, linguistic complexity, discourse structure, length of text, etc. 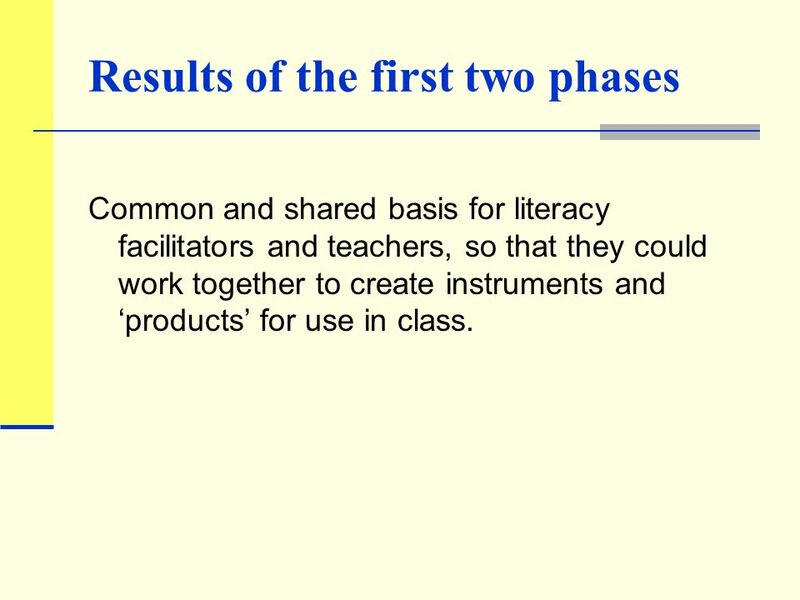 13 Results of the first two phases Common and shared basis for literacy facilitators and teachers, so that they could work together to create instruments and ‘products’ for use in class. 14 Second part of the project History tests were written and presented to the classes of various schools in the Municipality of Florence as from April 2006, and still under trial. By the month of June we expect to collect all the tests and perform a detailed analysis of the results. 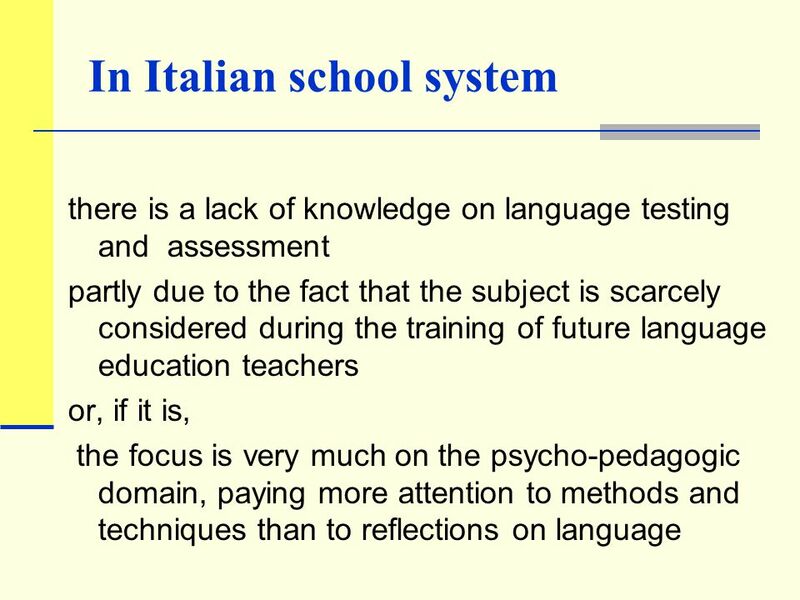 Download ppt "Testing and assessment of linguistic-communicative competence in schools: thoughts on L1 and L2 Linguistic Education Monica Barni, Carla Bagna, Sabrina." The Cost of Authoring with a Knowledge Layer Judy Kay and Lichao Li School of Information Technologies The University of Sydney, Australia. Principles and Standards for Learning English as a Foreign Language in Israel Schools ENGLISH Curriculum for all Grades. 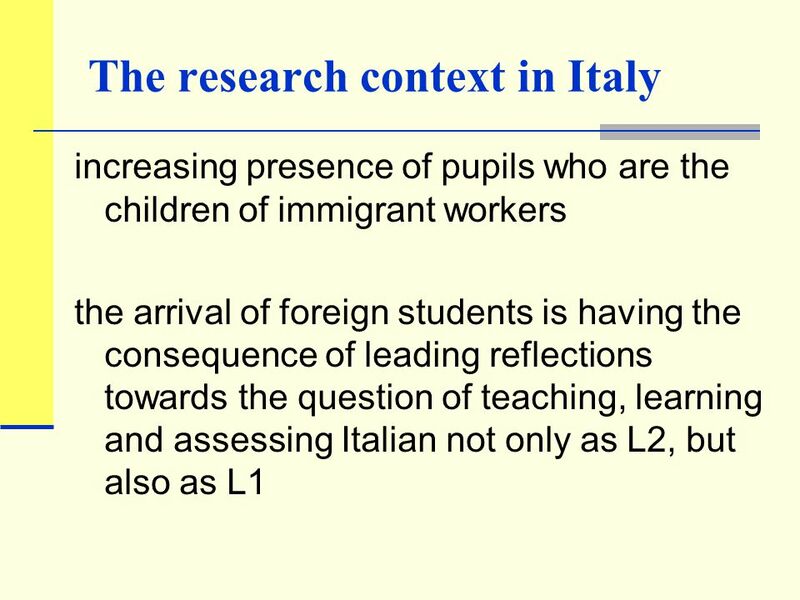 CLIL UNIPI CA TEACHER TRAINING COURSE April - June 2014 Report on the CLIL activity carried out at Liceo Classico e Scientifico «Euclide» Cagliari May. The role of learning outcomes in developing and reforming the Norwegian education and training system Tessaloniki Oct. 15 Ms Kari Berg. Secondary and Further Education Pupils into University: An outreach Summer School Project working with pupils aged fourteen to nineteen. Jane Ellis and. Adolescent English-language Learners: Challenges and Suggested Solutions Ramping Up Middle Grades Literacy Forum Phoenix, September 28 & 29, 2006 Diane. 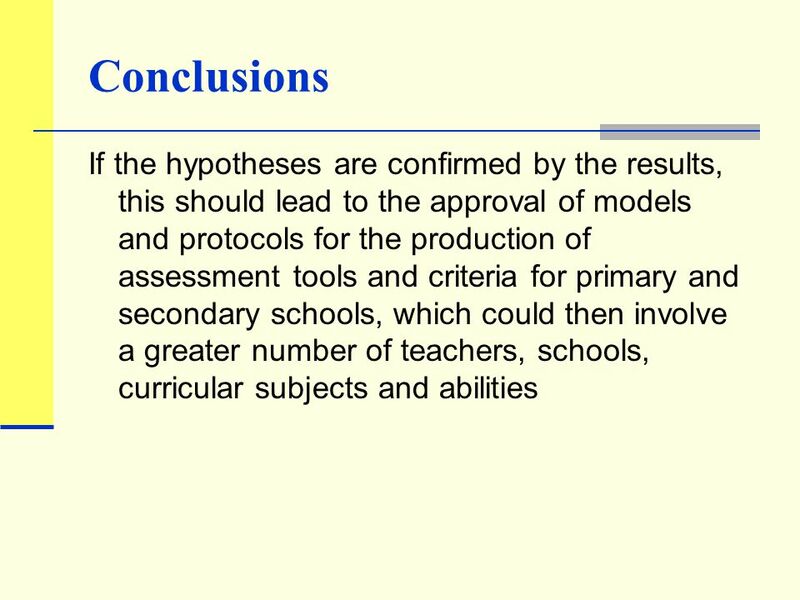 Good teaching, good teachers and comparative analysis Fernando Reimers. REPORT AUTHORS Madeleine Arnot, Claudia Schneider, Michael Evans, Yongcan Liu, Oakleigh Welply and Deb Davies-Tutt With the assistance of Karen Forbes. 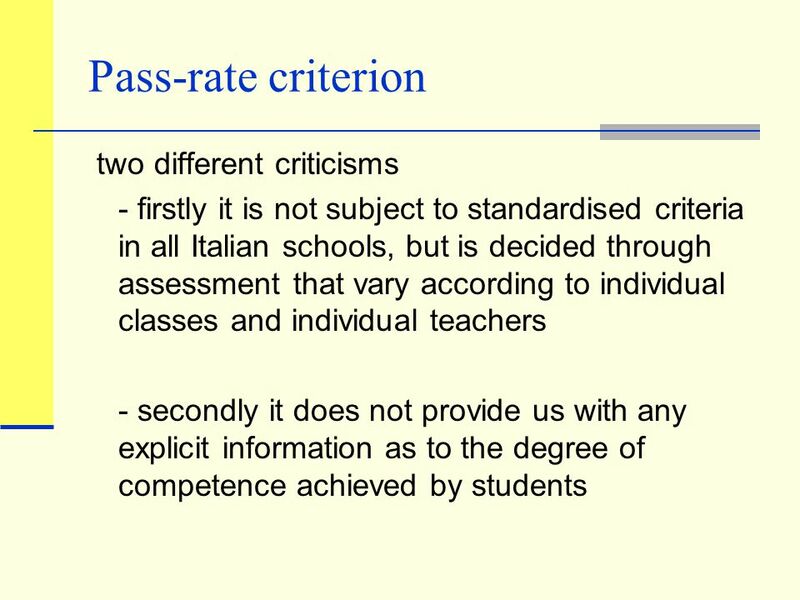 THE ITALIAN SCHOOL SYSTEM The Italian school system is free for all children. All children must attend school from age six through sixteen The system is.